Adding a mail contact form is a little hard for many of us and requires time to set correctly. 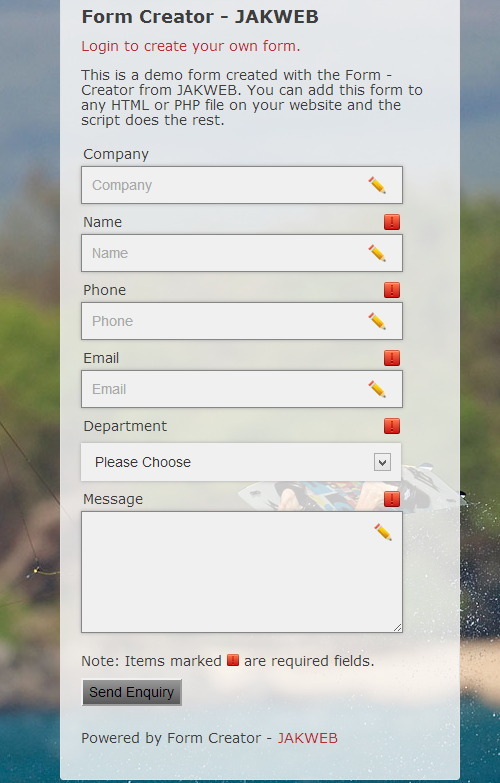 PHP contact forms are very popular when compared to asp.net language. 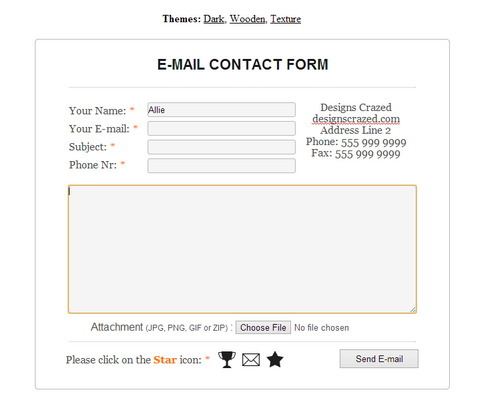 HTML5 website used by designers need a medium to allow customers to contact them so a php contact form is essential. 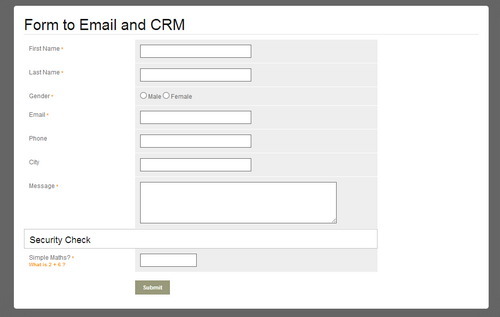 PHP powered forms along with AJAX will make the contact form even more pretty and highly functional to play around. AJAX eliminated the need of page reloads when we click submit and it does that function easily. A Linux with php – MySQL enabled will get you started unless you are on a shared server where everything is pre-installed on the server. A feedback system is essential in the success of a new brand hitting the market. Customers contact the website owner not only for support but also report any issues they are facing with the website itself. 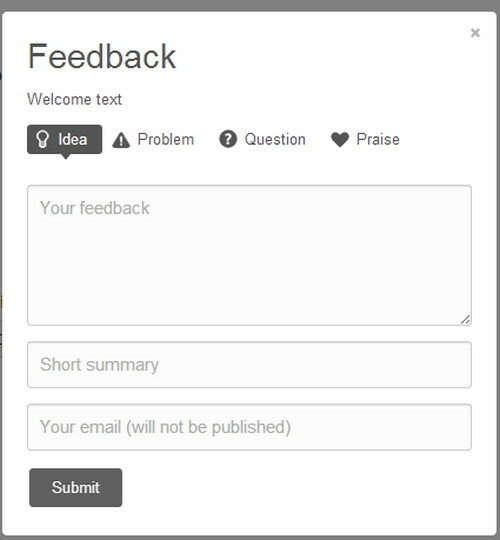 For reporting website issues or problems the feedback screenshot form listed below is just awesome so make sure to check the demo. 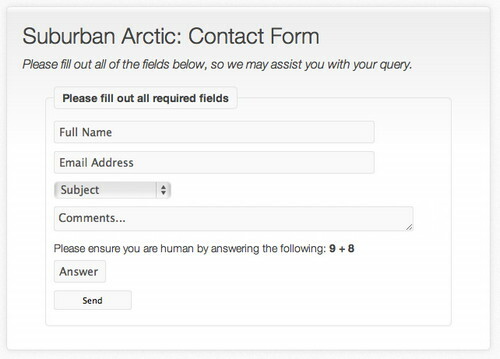 Contact forms have come a long way and are around for over two decades with the same function. AJAX is the new kid in the market introducing new features to the already better PHP contact form. We have choose some best php Ajax contact forms to simplify your contact form needs. 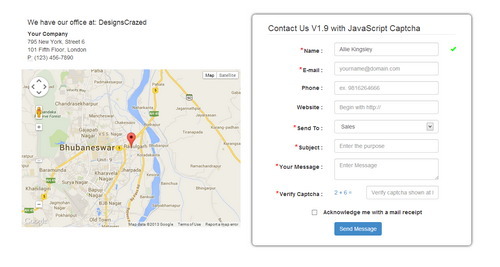 Also contains jQuery Ajax contact form which provide the same functions. 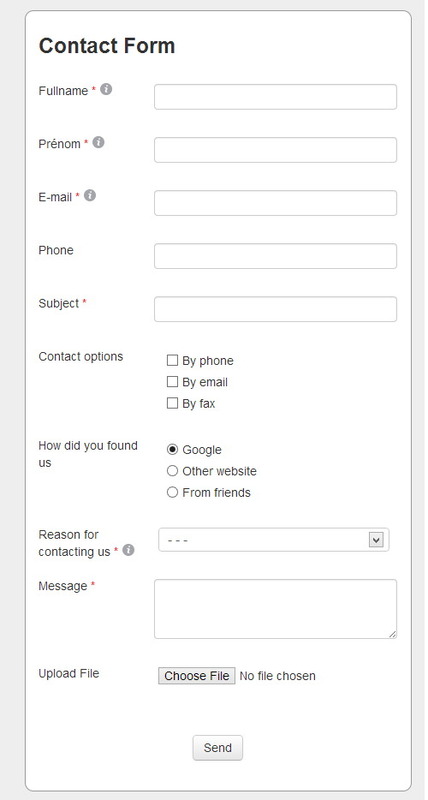 What makes this contact form distinguish itself from the rest is it’s simplicity and adaptability. 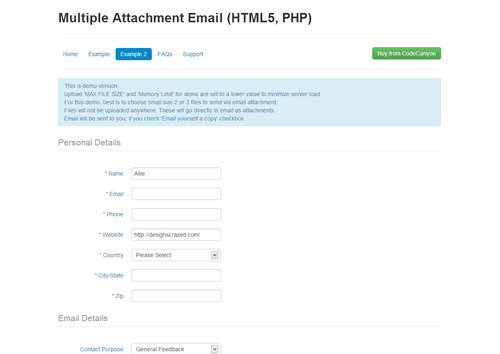 Whether you use native PHP, WordPress, Joomla, Drupal or Magento this contact form comes in handy as a separate script which is plug-n-play. 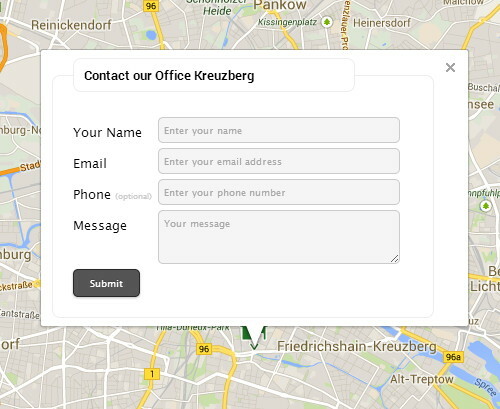 A simple contact form with Google map integrated to it and including superior features like file uploads, server -client side validations etc. 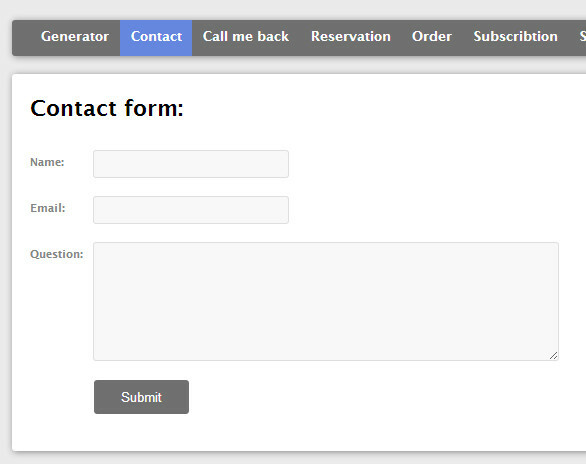 A Responsive AJAX PHP form generator which is able to generate contact forms, subscription forms, order forms and much more. 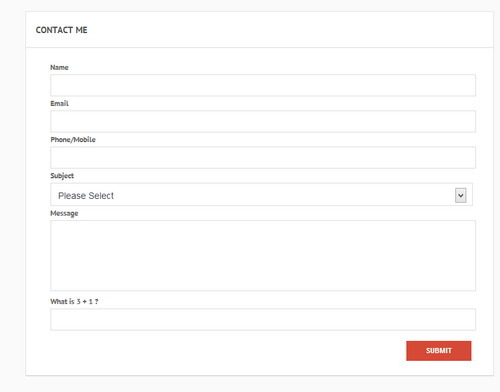 ContactZ is an easy, lightweight and a very customizable contact form. As special features a impress and a persons section are included. 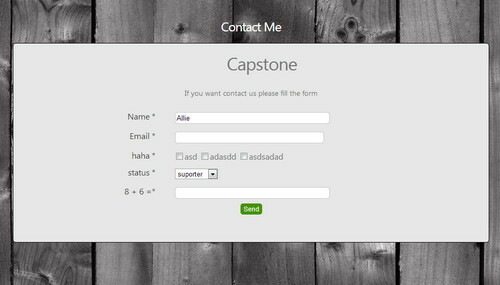 Another feature of ContactZ is the impress block above the contact form. Here you can set up a individual text in a HTML format. The map, which you can see at left part is also very easy to set up. You only have to enter a address, a city and a zip code. Then the people know, how they can get to you. 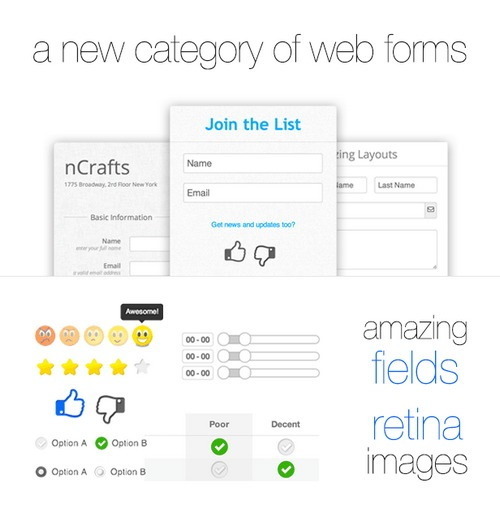 FormCraft provides you with an awesome drag-and-drop builder interface. 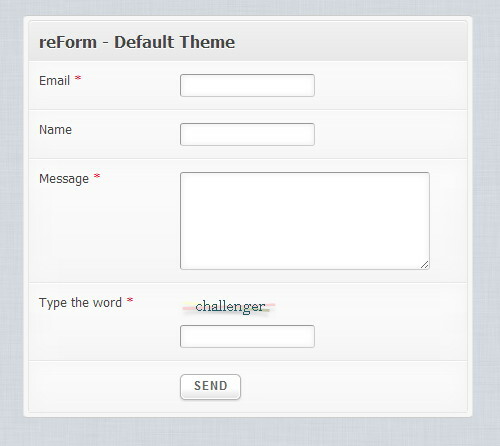 All the changes made to the forms are updated Live to the form on the right-hand side of the form builder. 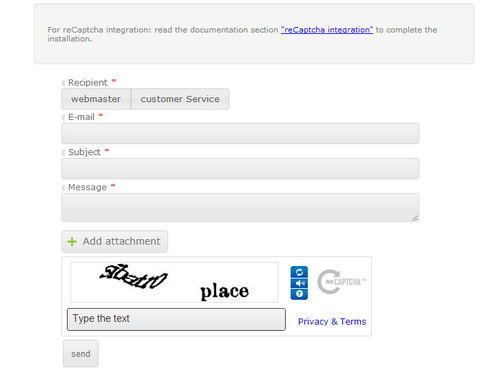 PHP One Page-One Class Contact form with-secure customizable captcha, j query, Ajax json validations. mail receipt acknowledgement,bootstrap design, Google map, mail templates, singleton class, well documented support, simple and fully customizable, purely object oriented codes. 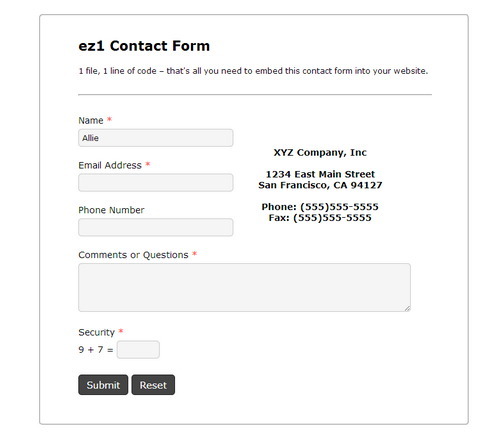 Add a contact form to your website with just 1-file and 1-line of code! 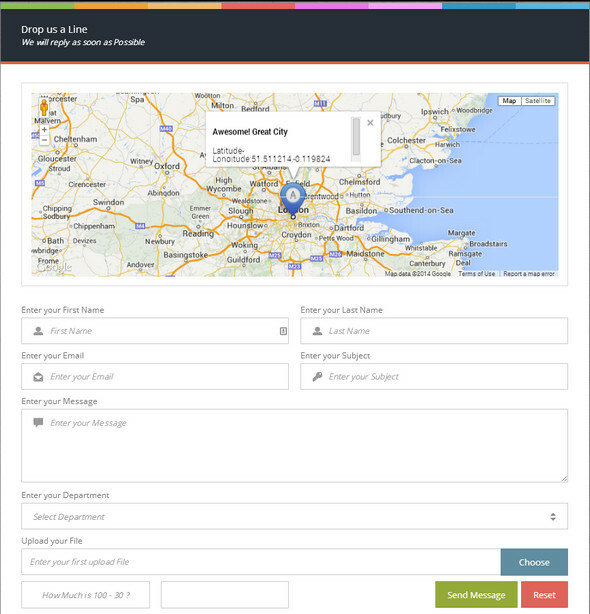 Built using HTML5 and CSS3 – completely table less design. 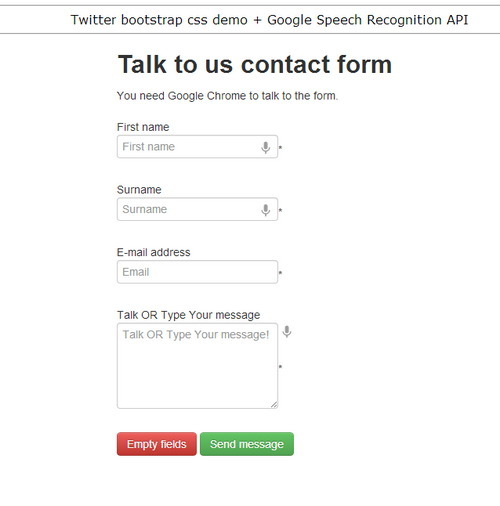 Talk to Us Contact form + Google Speech Recognition API is an easy to use and easy to install contact form with a spam protection timer. 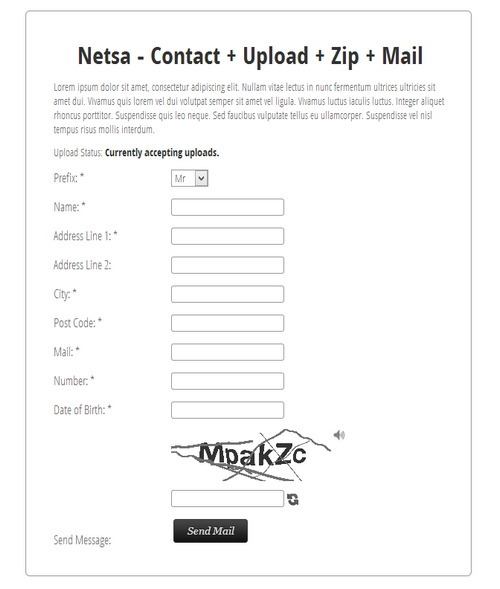 Netsa Contact + Upload + Zip + Mail is a web based application that will create any type on online forms with the ability to upload attachments, zip them on the server and send the documents and field information onto the desired mail addresses. The app has the following features. 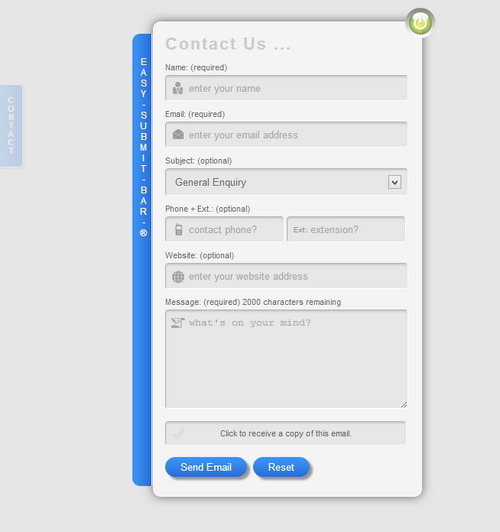 Mega Contact is a versatile and flexible Ajax contact form builder created from the ground up. 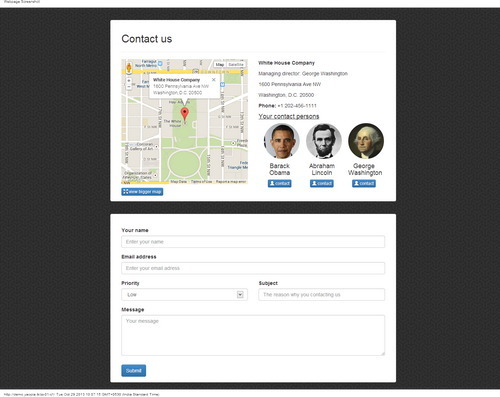 It allows you to quickly construct an Ajax contact form and incorporate it into your page. Both, front (JQuery) and back-end (PHP) are written in an Object Oriented style that allows for extensibility and code reuse in an efficient manner. 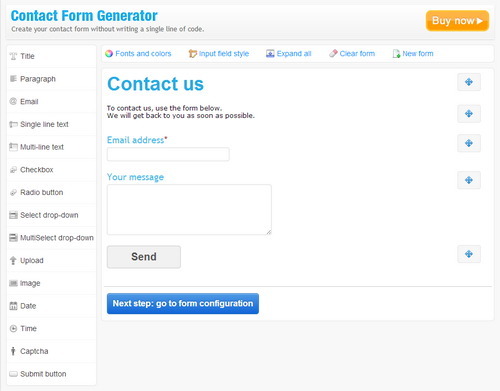 Sick of building your forms for your website, get the Form Creator and you will create forms in minutes. 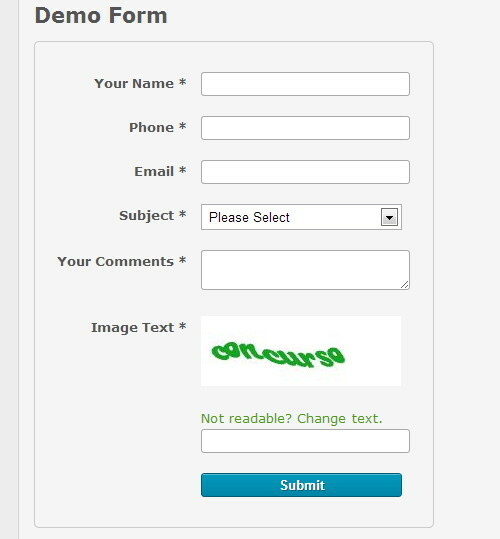 HTML5 and CSS3 valid forms for your website, create the form with the Form Creator and copy the provided code into your site. 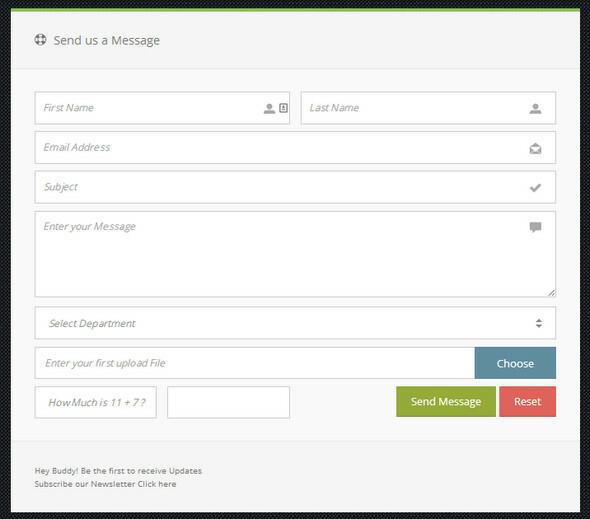 Contact form with Ajax that can be integrated with any website very easily and could be configured in minutes, without modifying any line in the actual source code. Plenty of pre-defined examples help you integrate the script the way you want it, whether database storage, csv export or submission to Google Spreadsheet. 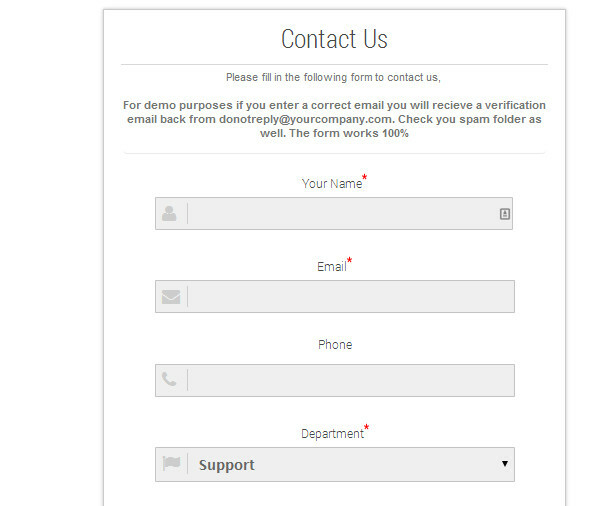 This AJAX Form can be easily used as a Contact Form, Registration Form, Inviter Form and more. 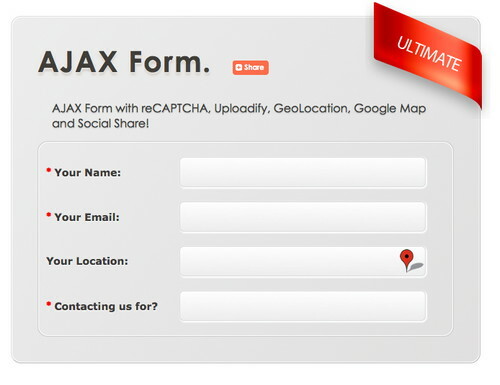 An Ultimate AJAX Form packaged with: jQuery, reCAPTCHA, Uploadify, GeoLocation, Google Map and Social Share! AJAX Form Pro a professional multi-usage web form meant to enhance the functionality of your website by providing an interactive user experience for your website visitors that need to reach you, whether they need to send a feedback, share their opinion regarding your website, fill a survey or even make a room reservation online. 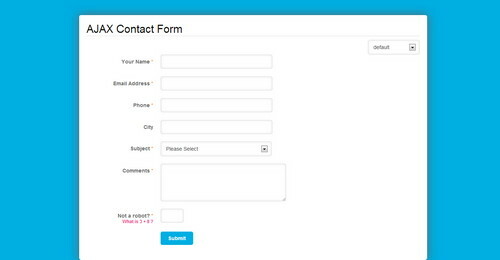 Best and most Flexible Contact Form available. Try and then buy it.